A thermometer for the whole family! The MeasuPro Forehead Thermometer allows users to get an instant digital body temperature reading with no contact necessary. No touch means no reason to wake a sleeping baby to get his temperature taken and also helps prevent the spread of germs. Designed with the user in mind, this thermometer is equipped with two LED lights that line up on the forehead when the thermometer is at the correct position. Simply adjust the distance until the lights are aligned vertically to ensure a consistent and accurate reading each time. Along with body temperature, this thermometer gun can measure the surface temperature of objects to gauge if an object is a suitable temperature for babies or patients. 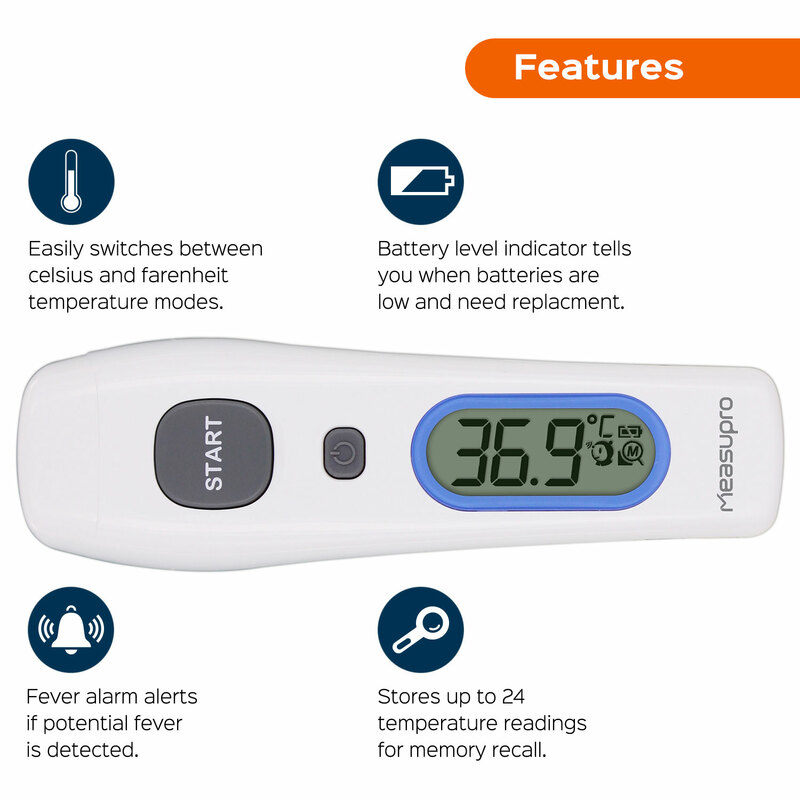 This thermometer features a fever alarm to warn of potential high temperature, a memory recall function that stores up to 25 readings and a mute option to measure in silence. Measurements are displayed on a large LCD screen and can be shown in either Celsius or Fahrenheit. The MeasuPro forehead thermometer ships with batteries and two year warranty. Cassandra's Review- Perfect for fussy kids and to keep everything hygienic. I really enjoy that is comes with batteries and this has a great accuracy reading. The results are fast.